Small World Underground ... When in a hole, Keep Digging! Great new races, new board, and new game elements to draw focus to particular areas of the board. A few races share a lot with the original Small World races, but it's altogether a very fun new version of the game! I highly recommend it! THIS IS NOT AN EXPANSION! Although, for it's price, it could almost be! It's a stand-alone different "version" of small world with the same mechanics and feel but all new races, board elements and special abilites to get you hooked all over again. This is a great game, Underground is a stand alone expansion. 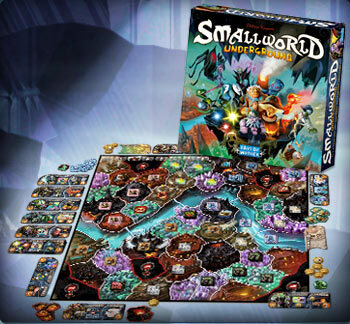 Basically you could just buy this game and get the great SmallWorld experience without have to also buy SmallWorld. However if you have the original you can mix in all the new races or even use the tunnel expansions to use multiple boards. What a great addition to an already great game. Better than the original! Again, the pieces are well made and the graphics are gorgeous. The added feature of treasures and ruins make this game even more enticing.